Every day MITRE researchers develop technologies and techniques with the potential to change the way our sponsors approach many their most basic challenges. Often, our technical and scientific exploration delivers results that transform a process, a system, or an organization. For example, one group of NSEC engineers has worked with the military to lighten a soldier's load in the field by making devices smaller and lighter. Others within MITRE helped engineers at Harvard to develop the world's smallest functioning computer. In MITRE's BioNanotechnology lab, researchers developed a toolkit capable of gathering and removing biohazards, such as viruses, bacteria, and chemical or biological attack agents. The kit uses biochemical-coated microparticles, suspended in a liquid or embedded on a cloth, that remove pathogens from surfaces just as a brush removes lint from a suit. Our innovators bring exceptional technical expertise to challenges that require fresh ideas and the imagination to recognize potential solutions in evolving or unrelated technology. For example, blogs and social media applications such as Twitter are alerting behavioral scientists to changes in cultural or regional sentiment. Used properly, this data has the potential to better predict political demonstrations or uprisings. Many MITRE-conceived tools and technologies have potential applications in the business world. 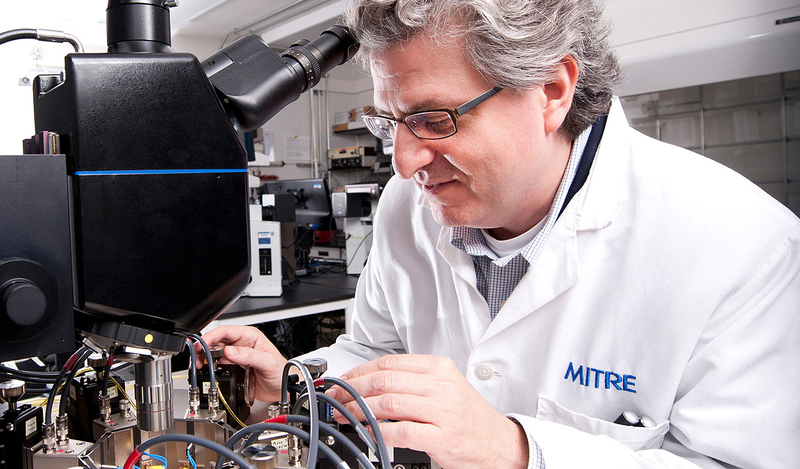 MITRE's Technology Transfer Office works with government and private industry to license technologies to commercial entities so the public can derive benefit as well. How Often Must We Apply Syndrome Measurements? Can We Pull Energy from the Wings of a Drone?